A much-valued community asset has been given a new lease of life in a refurbishment designed to a tight budget and with reduced running costs in mind. 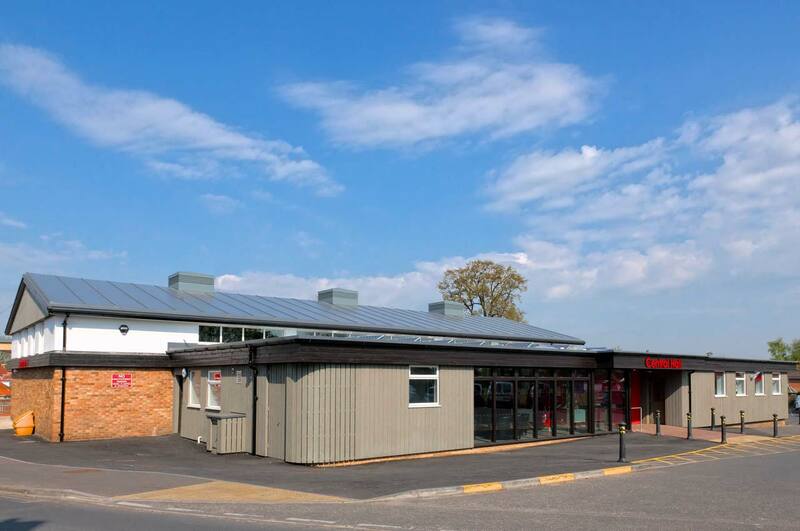 The project involved extending and improving the existing 1960’s hall and its facilities to bring it up to 21st century standards. The building has been given a new ‘front door’ – a timber-clad extension which accommodates a generous foyer and bar area, to replace the existing facilities which had become tired and unwelcoming. A bright redecoration scheme throughout, with strong accent colours in the hall, foyer and WCs has changed the character of the whole building. Ground-source heat-pumps were installed together with high levels of insulation in order to reduce energy consumption, carbon emissions and heating bills. Photovoltaic panels were located on the roof to generate sustainable electricity and a passive ventilation system has been installed in the large function hall. Greatly improved acoustics, and lighting in the main hall complete a refurbishment which has secured Central Hall’s future as the leading community venue in this part of South Norfolk.